A brighter future awaits former rebels of Kamtapur Liberation Organization ( KLO )as they have set up a Piggery farm near Kokrajhar, Assam. 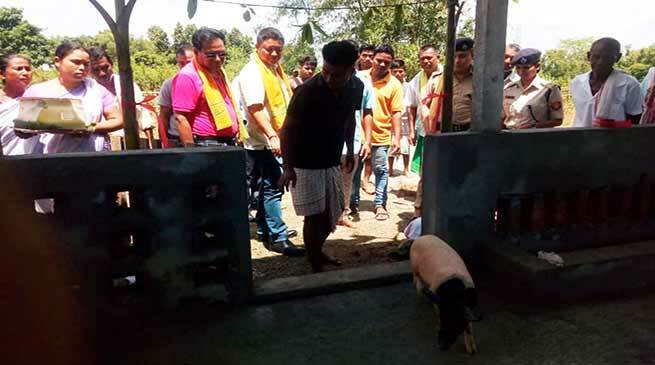 At least seven former Kamtapur Liberation Organization ( KLO ) rebels set up a Piggery farm in about 2.5 Bighas land at Bijilibari Chandrapara village in kokrajhar and seeking a new livelihood. These KLO rebels left the underground activities of the insurgent group, has been looking for a new way to humanity work which welfare for new young generation. Rajen Singh, Superintendent of Police Kokrajhar formally inaugurated the Piggery firm on Friday. Talking to media person Singh said that it’s good initiative for new young generations, he also mention that the kokrajhar police taken a initiative to setup this farm. Heman Ray, a Myanmar train ex Cader of KLO informed to media person that they have forgotten the past which once time they had fight with arms, now they seek to work welfare for common public. He also mentioned that there is nothing good result come with arm struggle so it’s better to move with Democratic way. Among others Rajib Brahma, EM BTC, TR Pegu, ASP Kokrajhar and intellectual of area were present in the ceremony.